As with most great things that happen with me the best ones happen by accident. And so it was with the Willow branches that I use in my stick artwork projects. I used to get the materials for my artwork from plum trees that I would spot in landscapes around the bay area and where I live in Nevada City. They were hard to find and took a lot of my time and attention. Sometimes it felt like I was almost having to steal them from roadside medians and along freeways. I needed to find a new way! I used to think that willow was kind of cliche/ common. and that I was above using it. 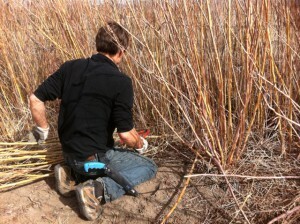 I got a job using willow on a fence and it changed my mind about it. I would drive from where I live in Nevada CityCalifornia to Mammoth, Ca going through Nevada on the way looking for materials. Usually when I put my mind to it what I am wanting usually shows up mysteriously and gracefully. I put up an ad in small stores and stations along my way to find ranchers who had willow and were wanting to get rid of it. 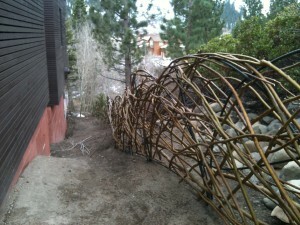 I made connections and one thing led to the next and before long I had pretty much all the willow I needed to finish the 400 foot willow fence I was building. I started to appreciate willow and the history of it’s use by the tribes in the area where I got it namely the Wa She Shu tribe in Nevada. Little by little I was instructed in the beauty and utility of this plant. My arrogance started to melt away. 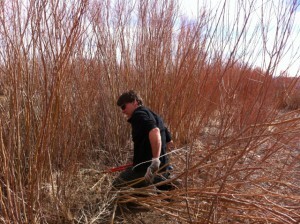 I stopped into the tribal office of the Washoe tribe and asked if they had willow I could harvest. Since I had already gotten enough to finish my project this would be for the future. This was a gift that I couldn’t see at the time. Eventually I started to make trips to the reservation to harvest and also to read about the Wa She Shu tribe and the way they related to the land and plants. It was more of a sacred relationship than a consuming one. A giving and receiving. When I went I would bring a gift to offer at the somewhat official trailer office of the environmental protection office and kind of sneak it to the first tribal person I came to at the desk and thank them. As I assumed this “give a gift receive a gift” positioning I would be available to learn all the sacred land and plants could teach me.It was harder at first and then became easier over time. I could even find my way to give the tribe a gift of money to make it more lawful to take the Willows. I could also mention the tribe in my description of my art. To me using sacred materials from sacred land made my artwork more special and meaningful and exposed more people to the tribe and what they had to offer. This process of learning makes my artwork more part of my spiritual and money making life. I am grateful! Here is the tribes web site. "David Wards delicate assemblages of twigs and branches are the perfect complement to the environments of Cheng Design.